For many people today, their first heroes were TV cowboys. Roy Rogers with his palomino Trigger, Gene Autry riding his faithful steed Champion, and of course The Lone Ranger and his famous horse Silver are just a few of the Western heroes idolized by children for generations. Those “thrilling days of yesteryear” turned into a lifelong love of horses for many people, with over 2 million people in the U.S. today owning horses. Horses represent a large investment of both time and money. Protecting these investments means sheltering these animals in the best facilities possible, both for the horses and the owners who love them. The durability of steel makes metal buildings much less maintenance-intensive than wood structures. The pre-cut steel components allow the buildings to go together quickly and easily, with minimal equipment for horse arena construction. The superior strength of steel permits large, open spans for unobstructed metal barns and covered or indoor riding arenas, making RHINO buildings perfect for horse arena construction. Since steel isn’t organic like the wood used for pole buildings, it won’t add fuel to a fire, nor attract termites and mold. Natural lighting can be added to all RHINO metal structures with optional skylights or wall lights. Furthermore, expanding RHINO metal buildings as your business grows is simple — just add additional steel framing bays to the end walls of your existing structure to enlarge your barn, hay shed, stable, and covered or enclosed riding arena as needed. Nothing is more relaxing than riding your horse on a clear, beautiful day. Unfortunately, the weather doesn’t always cooperate. 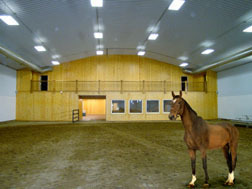 Steel indoor horse riding arenas are a great option for horseback riding indoors, particularly in areas with extreme weather conditions. Many riders opt for completely enclosed and climate-controlled steel indoor riding arenas that allow for year-round teaching and training. This keeps businesses from losing revenue on bad weather days, and well-lit indoor riding arenas also provide a safe place for evening riding lessons and training sessions. In milder climates, these arenas can be open air buildings with a covered roof, similar to a pavilion. These structures protect both riders and horses on days with rain or extreme heat. RHINO has sold many metal indoor riding arenas in recent years, and has completed horse arena construction along with metal buildings for barns, stables, hay sheds, and other equestrian facilities. The same RHINO steel structures used for horse arena construction also work well for covered pavilions and outdoor event centers. In 2008, Links Construction of Denton, Texas ordered a RHINO pre-fabricated metal for Chapel Creek Ranch horse arena construction in Sanger, Texas. The ranch breeds and trains magnificent Spanish Andalusian horses used in the pageantry and jousting performances at the Medieval Times Dinner and Tournament “castles.” The training arena is 100’ x 150’ x 16’. Almost 50 million people have visited the nine locations of Medieval Times in California, Florida, Georgia, Illinois, Maryland, New Jersey, South Carolina, Texas, and Canada. The horses for all nine Medieval Times castles are trained at Chapel Creek Ranch location. In Wise County, Texas, a fantastic new horse arena for Outlaw Equine was constructed. Using two connecting RHINO prefab steel buildings, the veterinary service includes offices, stables, and even a swimming pool for horses. The buildings measure 100’ x 70’ x 21’ and 100’ x 230’ x 15’. The reasons we love horses are clear: they represent a freedom to fly across the countryside in harmony with the horse beneath us — and the world around us. Steel farm and ranch buildings also offer a type of freedom — they provide freedom from worry over the protection of the horses we love. Contact RHINO Steel Building Systems today and let one of our friendly and experienced steel building consultants assist you in choosing a RHINO metal barn, hay shed, steel stable, steel indoor riding arena, or other prefab metal building. Call us today at 940.383.9566 for information on horse arena construction. 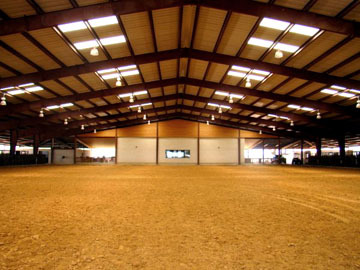 Share the post "Indoor Horse Arenas"